on November 21, 2018, 2:47 p.m. The e-commerce carrier heads the list with a score of 77.2, underscoring Malaysian consumers’ purchasing habits shifting to shopping online. The top three is rounded out by Chinese electronics manufactuer Huawei (77.0) and Singaporean national carrier Singaporean Airlines (76.7). Japanese brands make up a sizeable proportion of the top ten. Automotive companies Toyota and Honda come fifth (74.3) and sixth (71.3) respectively, Japan Airlines is in seventh (71.2) and Japanese retailer Uniqlo in ninth (68.9). Other e-commerce platforms also feature prominently, with Lazada in eighth (69.7) and Book Depository in tenth (67.8). The list is completed with instant messaging platform WhatsApp in fourth (76.1). YouGov also shows which brands have the most improved levels of customer advocacy. Shopee not only dominated the top ten, but has also shown the most improved score (a rise of +14.6 points). It is ahead of Malaysian autmotive manufacturer Perodua (up +12.0 points) and subscription video-on-demand platform Netflix (which improved by +11.2 points). Ervin Ha, Head of Data Products commented: “Shopee is a clear favourite amongst Malaysians, with their fun ads, and promotion such as their recent 11.11 big sale. 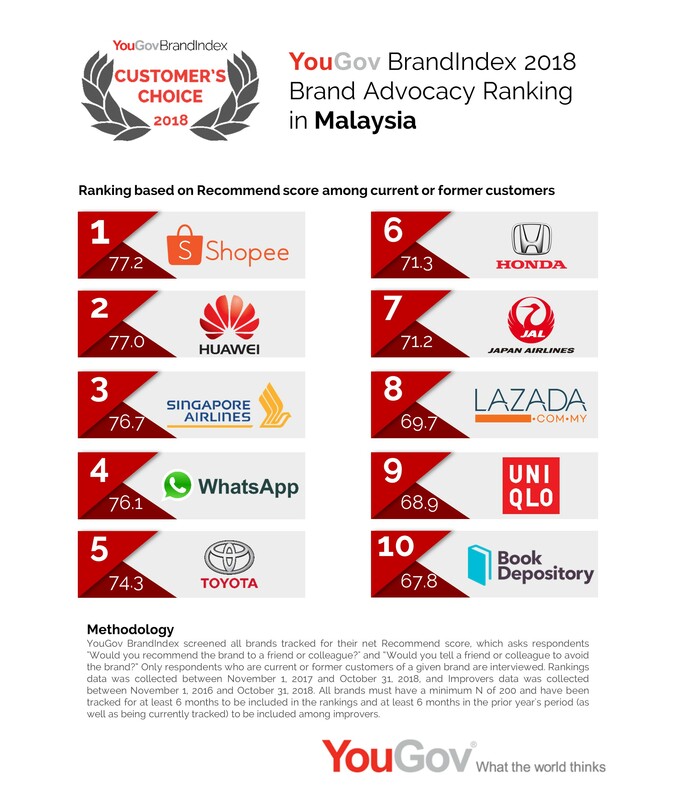 While Shopee might have the strongest advocates of any brand, but it’s Japanese brands that are most recommended amongst Malaysians. Be it automobiles or airlines, Japanese brands have won over consumers and their vote of confidence”.